По комментарием к Сейф валарьяров - стало понятно, что он не падает со 100% вероятностью. Качаем репу с Валарьяры до превознесения. После чего за каждые 10к репутации дают Сейф валарьяров, с которого и дропается даный маунт. получил с сундука за экстра-репу с валарьярами. Выглядит 1:1 как флай-такси из Валдисдаля. Во-первых это единственный маунт, который выбился из прорисовки wow. Он просто прорисован в другом стиле, такое ощущение, что работал другой человек. Очень жаль если Близзы будут делать винигрет. Ведь всем нравится их умение держать себя в этой сказочной среде. Во-вторых, ну может не весь маунт, но голова убогая напрочь. В-третьих, драконов уже пруд пруди, можно было придумать, что-то другое, совсем у Близзов с фантазией худо. Сам собираю маунтов, но не буду получать этого - он испортит всю коллекцию. Выпал сегодня, даже и не знал что с сундуков падают маунты. Драк шмкарен. Всем удачи с дропом. Как по мне, то такая система получения маунтов полнейший бред. К примеру, если ты ходишь и фармиш Босса с надеждой, что с него таки выпадет нужный тебе маунт - это одно. Но когда набиваешь репутацию с фракцией до экзалтеда и ждешь награду за это, а тебе предлагают еще фармить её до посинения - это полная фигня. В итоге тебе остается только наедятся на свою удачу (упадет он тебе с 1го раза или 100500го - рулетка же). Эх... Почему убрали этих маунтов в Интендантов за превознесение я не понимаю. Как в старые добрые времена. Рандом.Такой рандом. Уже устал делать дейлы чтобы побыстрее получить сундук и в итоге полутал много чего. Вещи ,леги а маунта так и нет. Из всех фракционных сундуков маунт этот самый пушечный . An un-armored version of Грозовой дракон карающего гладиатора for us non-pvpers yay! The legion alpha patch notes datamined this mount. And I waited so long to finally be able to see it in live! Finally, a chance to obtain an unarmored thorignir. I can't wait to ride this lovely storm drake and purge Skovald from this land! Finally a non-pvp Storm Dragon, these are huge, imagine a Tauren riding one. I can set the camera far from my tauren but their wings still outrange the screen. Штормокрыл валарьяров is a low-drop from the 7.2 post-exalted (paragon) emissary chests, specifically from the Сейф валарьяров. This mount is considerably smaller than other drakes. My orc rogue looks overly large on this one vs something like the Drake of the North Wind. Dropped today from the new 10k rep bag. Nice supprise. Got it today from the first paragon box ever opened. Pretty happy! Just got it from my very first Valarjar rep bag. Such a beautiful mount! Got it from my first ever Valarjar Strongbox! Pretty happy. I received this mount today on Caelestrasz after handing in the quest. This is the first time I have done the quest for one of these strongboxes! Wish everyone the best of luck ! Just drop this incredible mount after open 7 valarjar strombgox. The mount has little lightningbolts going over his wings, you dont really see it when flying though. Also it looks amazing in combination with the darkmoon faire nightpotion. After you get exalted with Valarjar reputation, you need to farm more 10k reputation through valarjar world quests/tokens in order to receive a: Сейф валарьяров. In thisstrongbox there is a small chance to get the Штормокрыл валарьяров. 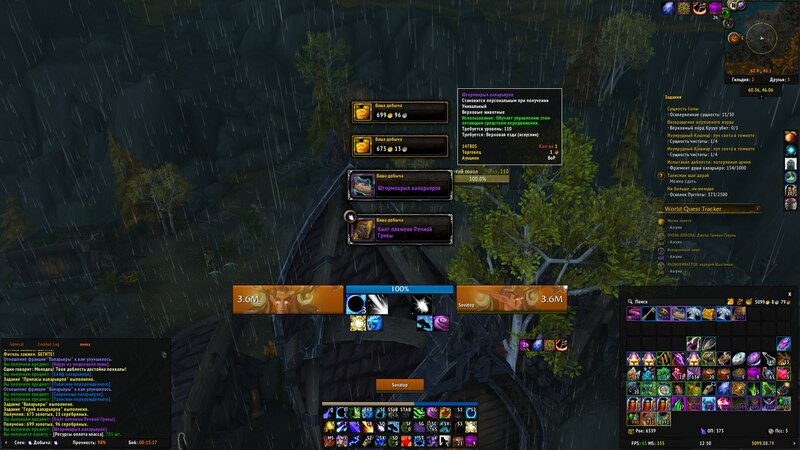 Just like valarjar, all other legion reputations have this "special farm sistem" and each 10k reputation farmed you get a box with a small chance to get a mount/toy/pet - depending the box you open, its one special reward. I will show my farms numbers and you can take your own conclusions. This is a depressing implementation on Blizzard's part. I don't mind the little extra grind past exalted. I don't even mind that unlike previous expansions we don't get to just buy a mount for a ridiculous sum after hitting exalted. I actually thought it was kind of neat. Made me feel like I was making an impact for the characters in the game... But then I opened the box for my sum of gold. Like, really? Joe Shmoe right next to me does the exact same thing and gets the dragon mount... Is Odyn is just like "Put a dragon in only SOME of the boxes quartermaster. I want to see them REALLY PROVE THEMSELVES!" I don't mind a grind with a goal in mind, IE Netherwing Drakes. What I hate is a grind with the intent of trying to keep players minds off the lack of 7.2 progression each week because "We put in a lot for the classes."... They very well may be but the main story is rather lacking and it is frustrating to feel like when I get on WoW it becomes a senseless grind. I don't mind working for something. I love that rewarding feeling when I really try at it. I will keep at the CM artifact appearance until I finally obtain it. But time and skill should reward the effort. Not some lotto system of "Better luck next time ;P". Sorry for the rant, I love WoW, but things like this really make me mad. Edit: Just to clarify: This is all coming from a guy who has Both Warglaives as of 3 years ago and the Nether drakes. I'm not saying all RNG is bad, but it is in this particular instance. To me it's not the same as mog running old raids. If you run those there's at least a decent probability of getting at least something you want in a few runs, where as the real prize may take a while (took me almost 2 years after getting the first glaive to get the second). Stacking percentage rolls would be a better idea for this because we already dealt with the long grind to exalted. adding a never ending grind past that holds little to no fun or comfort when it usually takes a full week to complete it. Earning the Shado-Pan serpent after weeks of end-game quest progression? 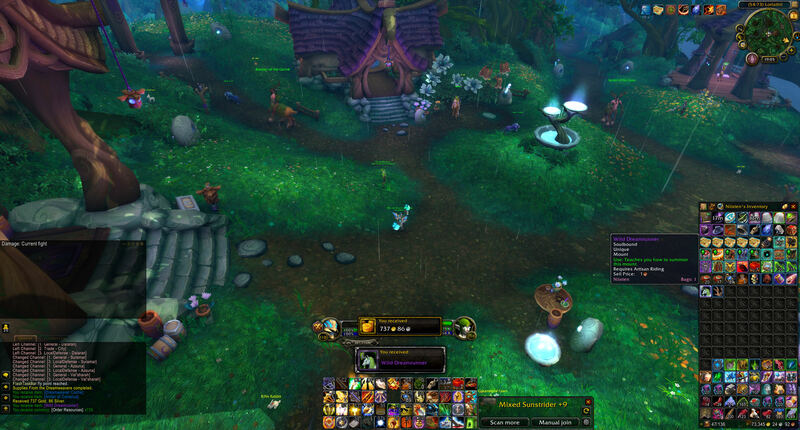 Awesome end of rep questing that felt important to both the faction and the character! Grinding over and over until you shoot yourself from opening 200+ alts combined? Not so much. In the end if you want something bad enough you'll take the time and effort. I'm not a guy who likes handouts, I just want variety in the formula, an alternate route to grind>box>squat>repeat. It works in some cases, just not one you already tied to a prior rep grind that people would actually rather spend the silly amount of gold necessary. Blizz pls make the dropchance 1% or lower. It its 5-10% and this is to high. 1.6 of all players already have the mounts this is insane. So 318% is definitely not the correct drop chance. Does anyone have the correct data? I'm curious the drop % of these because I got the hippogryph and moose from Highmountain/aszuna in 1 chest opening and the Stormwing drake in 10 or less. Came here to check about other Storm Dragons and was preparing to find the purple/unarmored one gated behind a raid, quest or even gold and sadly found that there's only one available, the red dragon in the rep caches, I mean, why not adding the other color variants as drops, exalted purchases or/and raid/dungeon/quests rewards? A very depressing grind. I feel extremely burnt out just doing a fourth round of world quests on a fourth character out of a possible 14. Blizzard implemented these at a low drop chance so that people kept doing world quests, however, I am at the point where I want to stop doing world quests completely and just get passive rep tokens via the order hall. Why don't they just make rep account-wide, implement the 100% rep bonus like in MOP, or even give rep tokens as WQ rewards like they do in Argus. I have opened 50+ Broken Shore boxes and got nothing. btw, I actually have all the paragon mounts after switching to order hall only rep tokens. Been farming the paragon mounts since Apr on 4 characters and this dropped for me on my 22nd box. It's a very hard grind, and I sympathize with players who had already opened up 50 boxes and got nothing. I had to commit at least 3-4 hours per day and I had to do the quest in each zones 4 times! I had no time for raid, dungeons, leveling or anything really. I never felt so burnt out before in previous expansions. I really hated RNG in this game, from your legendaries, to titan forging, to Greater Tribute of the Broken Isles dropping rep other than the ones you need, mounts and pvp rewards! I am really burnt out. Enough of these bs! Have already unsubscribe. 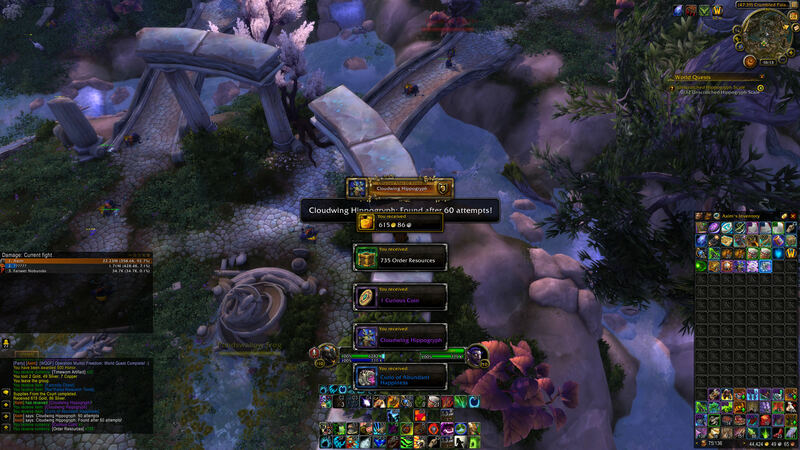 PS: I also had a some "Paragon Caches Turned in Achievement" ? when turning in the quest on this alt character and got the mount right after. Not sure if this was ninja patched. Good luck and take care. See you in the next expansion. So to all the people who months.. and a few more months.. and lets add another month that said things like "Its not going to happen right away, too bad for you. Grinding isn't your thing." If you said anything like that because you were bored and decided to comment on wowhead. Think of the most horrible thing you've ever thought about someone in the context of a videogame. That is what I think of you right now. I hope no one actually read this. You can look at when I did my previous rage comment. Just failed another box. I stopped counting, but did not stop grinding. So prob getting close to 100 boxes. This is the least amount of fun I've had in a game(grinding then opening). I actually lie to myself and pretend the gold I make from questing is the real reward. Screw whoever thought of this, because you said "fuk the ppl that don't get this, fuk them and too bad." Great logic, solid outlook. And yes, I think everyone who opens a cache deserves this mount. I don't care about seeing 10k ppl on it, I actually think that would be kind of cool. I feel insanely lucky. I've done a total of 10 paragon bounties, and I've gotten both this and the Dreamrunner already.. I'm sorry to anyone who's still hoping for this. You know what's worse than never opening this? Opening this twice. Yay, 1 copper. I have opened more than 20 boxes and I still haven't got the mount, for 10,000 rep per box AKA per chance is too much time investment for a RNG for something that the past expansion was something you bought at reaching exalted. The RNG on this is horrible. You can get the supplies for months and still not get anything. But that's standard. Now let's get to how this is much more vile than standard. First of all, to actually get the supplies without spending hours every day on world quests you need to do order hall missions. And - here's the rub - you will need to do them on more than one character. So people who only play one hero - you can forget about this mount. All those players are at a strike cut off from it. Secondly WHY, oh why would you want to hide this mount behind an entire artificial farm spam wall? I mean it IS the new and unique design of dragon that legion brings with it. But rather than celebrate it, it's made so hard to get that the vast majority of players will just give up on it. And thirdly - the non-mount items from the supplies are completely useless. You don't get the good follower gear from them, just the blue and purple trash that no one uses. The amount of gold you get from them you could get from any random gold awarding missions, which take less than 1/20th of the time it takes to get a supply cache. And the same goes for AP. The entire system needs a rework - raise the mount drop chances and make the regular rewards actually worth getting. GOT IT after 58 boxes .... to the hell with this paragon &*!@! I hate it! I can't believe this finally dropped... and then bugged out on me. When I clicked on it, it disappeared from my bags, but doesn't show up in my mounts! Now I have a ticket in with Blizz. Hopefully it gets fixed. Lame. Legs: Roots of Shalladrasil(This one was extra important in time keeping) and Roar of the Seven Lions. Start by buffing with pot, rune, and feast. I averaged 1 Valarjar Strongbox every 4 or 5 hours or so factoring in dungeon lockouts and boredom. I'm sure if I really put my mind to it, i could have done 2 or 3 in a day.. Believe it or not, got it on my first prestige chest with the Valajar. RNGesus must really be on my side. Have yet to get any of the mounts/other rare goodies. Got mine on 4th box! Woohoo! I just received this mount today. I am unbelievably happy and grateful. I've wanted this mount more than any other. My technique: I collected multiple boxes and opened them all at once. 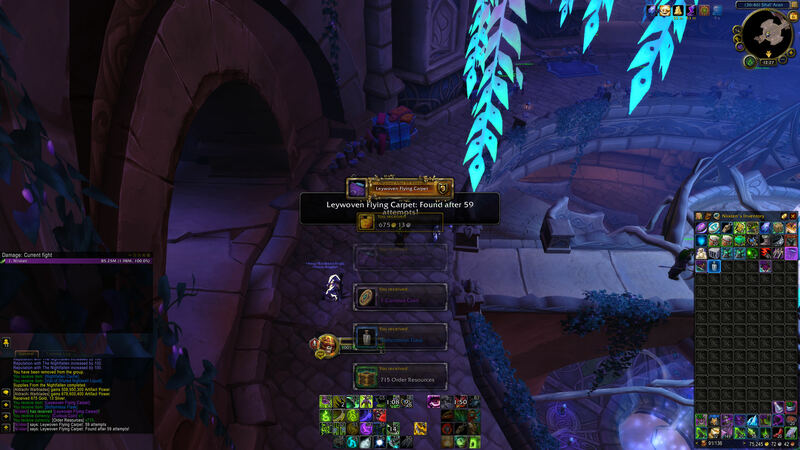 I collected the emissaries and rep boxes all on one toon and opened them all at once (I used to use this technique with the disgusting oozeling pet to farm gold) and it worked on my first try. I'm lucky it worked on the first try, but still, the technique is another option for those that use multiple toons. Just keep one toon to horde them all untill you're ready. Good luck to everyone. I hope you all get it very soon. I have no idea how many I've opened. Probably close to ~80 at this point. Let me put it this way, I have 10 alts. When these boxes came available, 5 of them were exalted with the Valarjar, now all 10 are exalted with them and I'm still yet to get this mount. Extremely frustrating. Since i have seen so many people complaining about their drop luck i thought i might do the math on it to prove that either you're actually unluckly or you're not. I don't want to explain it since english is not my native language so i would have a hard time to describe my process. You have a X% chance of getting the mount on your y attempt. It might seem wrong or confusing to some but it is in fact correct. For those of you who will ask ''why no 100%?''. Because it is literally impossible to tell when something is going to happen for sure if there is just a chance for it to happen. However you can get as close to 100% as you wish. so for 99,99% you would need 180 trys and so on. I hope i helped you guys out. If you want i can show the math behind it even though it would be pretty hard for me to explain it properly. After approximately ~100 attempts, running this one 10 characters since the caches were released in Legion; I finally got this mount today. Thank God it's ^&*!ing over, I no longer need any of the cache mounts from this expansion. Know what's terrible about this mount? OK, fairly rare thing to get. Lots of people farm for it and never get it. I got one just purely by opening a box. Didn't even know they dropped mounts, didn't really care. But I got it and thought, cool, drake mount. That was pretty lucky. Yay for me. Then I looked through my available transmogs for the paladin. Then the shadow priest. Then the lock. Then the shaman. Nothing matches. Nothing even comes close. That weird part red-orange-brown colored body with purple nails and the cyan lightning highlights everywhere. Nothing. The ONLY set I could find that even came close was the . But it doesn't look brilliant. So I go looking around for stuff...and lo and behold, I find this: . It's PERFECT. I'll grind for it if it's possibl.....oh wait, unavailable? The only armor, let alone set, that matches the color scheme of this rare mount, and we can't get it. So, meh, don't wish for it. There is nothing to wear that matches it worth a damn. I ran out of things to do that I like in BFA so I figured I would do world quest in Legion. I did world quests and wasn't really expecting anything to drop as knowing cool stuff drop less. For some reason, with BFA my husband and I got Valajar Stormwing from his first Valajar strongbox and my 2nd one. 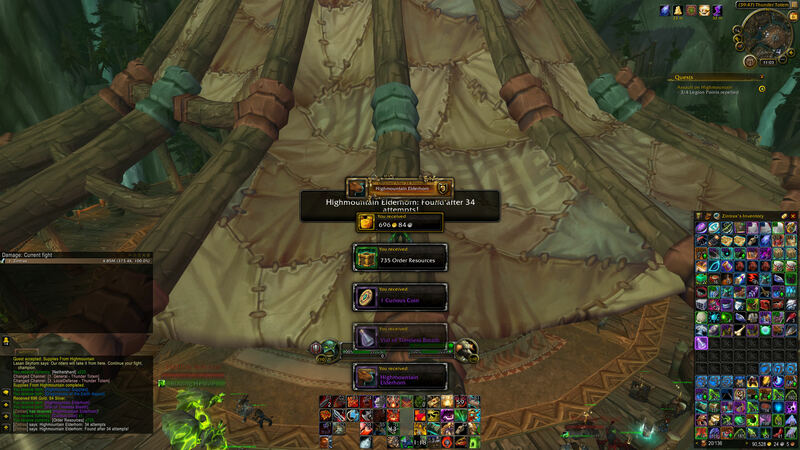 I also got the Wild Dreamrunner and Highmountain Elderhorn at the 2nd time I filled up the rep bar. I was thinking they probably increased the drop rate for this at BFA. So just do world quest and don't expect. It's nice to get surprises sometimes. This will probably get downvoted as people will think 'oh its just another "this drop for me!" comment'. It's not I'm just trying to share my experience. Happy farming! "Хлопанье его крыльев напоминает очень отдаленные раскаты грома."